The Rivers State Governor, Nyesom Ezenwo Wike has warned the Independent National Electoral Commission (INEC) not to contemplate postponing the Rivers State elections as part of a grand plot being hatched by the All Progressives Congress to manipulate the Rivers State election. 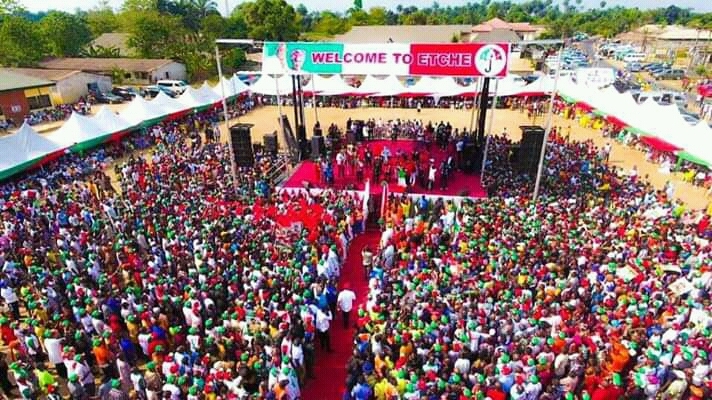 The Governor gave the warning while speaking to a mammoth crowd at the Peoples Democratic Party Campaign Rally at Okehi in Etche Local Government Area. 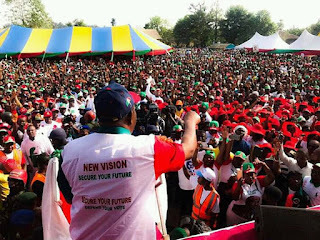 Governor Wike said any attempt to shift the Rivers State election in order to manipulate it would be resisted. 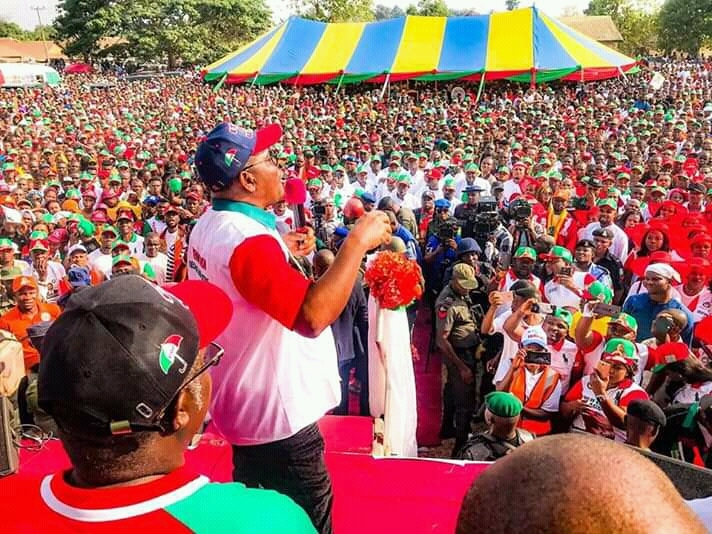 The Governor informed his teeming supporters at the rally that INEC had already taken a position against shifting elections, as was the case in the Ondo Governorship election, where the PDP did not have enough time to campaign. He said the same principle should apply in the case of Rivers State rather than for INEC to shift its ground. The Governor accused INEC of partisanship and noted that its inability to be steadfast to its principles impinged on the Commission’s credibility and independence. The well attended Etche Rally saw the handing over of flags to standard bearers of the PDP in the area among whom were George Sekibo for Senate, Ephraim Nwuzi for House of Representatives and the duo of Nnana Opurum and Tony Ejiogu for House of Assemby representing Constituency 1 and 2 respectively. 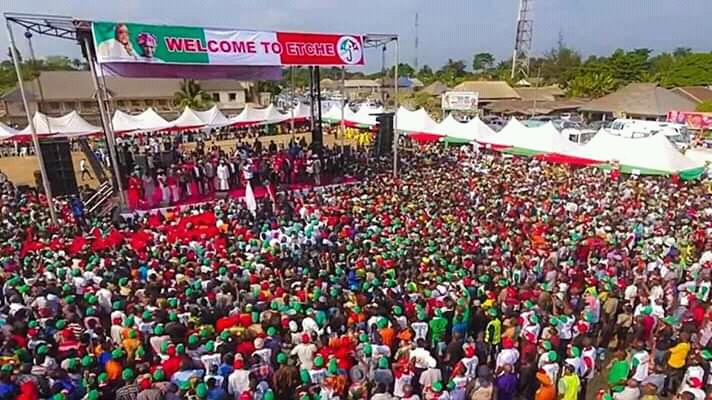 Governor Wike charged the people of Etche to remain steadfast and ensure they mobilized themselves to pick up their remaining PVCs and turn up on Election Day to cast their vote for the PDP. He assured them that a vote for the PDP Presidential Candidate Alhaji Atiku Abubakar would bring jobs and economic opportunities to them. Earlier, the Governor led his entire campaign team to a church service organized by the Anglican Diocese of Etche, where the Governor was conferred with the Nehemiah award for his contribution to the growth of Christianity and the development of Etche land.